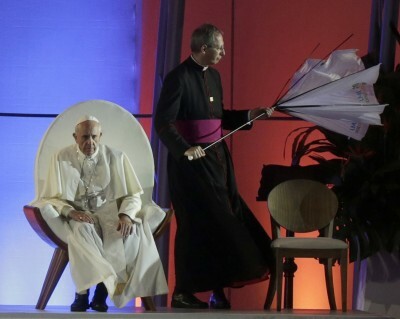 RIO DE JANEIRO (CNS) — Even at its stormiest, the Sea of Galilee doesn’t have waves like those pounding Copacabana beach, but Pope Francis asked young Catholics to imagine they were with Jesus on the seashore and he was asking them to follow him and share his love with others. 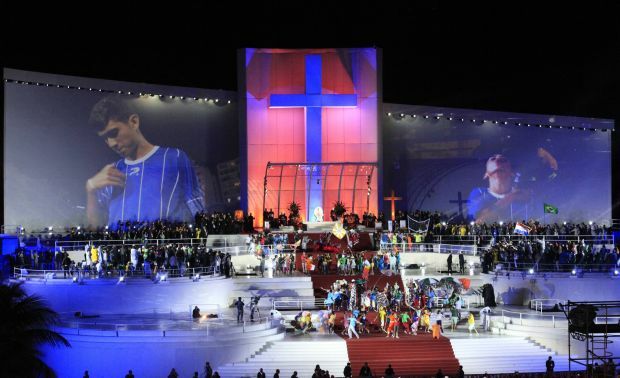 In his first remarks to the young people at the huge World Youth Day celebration on the beach July 25, Pope Francis spoke of belonging to the great family of faith and that included a moment of silent prayer for Sophie Moriniere, a French pilgrim who died July 17 in a car accident in French Guiana. 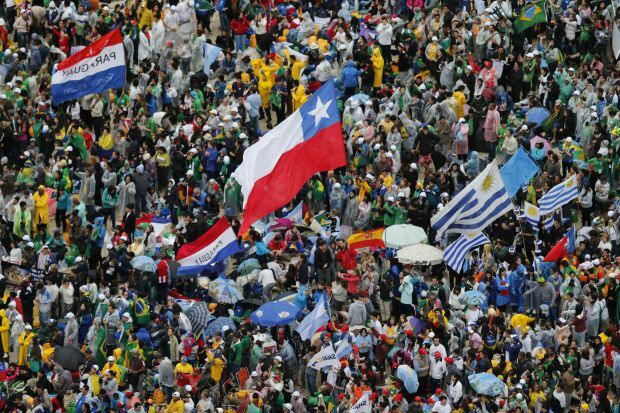 The nations were present on the windswept, rain-drenched beach where hundreds of thousands of young people began gathering just after noon for a program of prayer and song dominated by Brazilians, but featuring groups from around the globe. 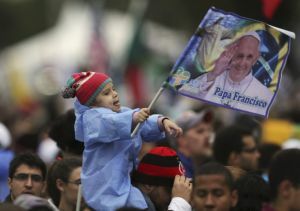 But tens of thousands of young people abandoned the sandy beach for the paved roadway when the pope’s helicopter touched down at Fort Copacabana; the pope spent more than half hour driving from the fort on one end of the famous beach to the stage situated about two and a half miles away. Jesuit Father Federico Lombardi, Vatican spokesman, said an estimated 1 million people were on the beach for the ceremony with the pope. The diversity represented at the event was not simply a matter of the national flags the pilgrims were carrying. Pope Francis said he knew the youths also had a variety of reasons for being part of World Youth Day and a variety of levels of previous involvement with the church. “But today you are all here — or better yet, we are all here together as one in order to share the faith and the joy of an encounter with Christ, of being his disciples,” the pope said in his introductory remarks. She also said she was impressed by the Masses and other gatherings where everyone seemed to know the words to the songs and were willing to sing along. The Gospel reading for the evening prayer service was St. Luke’s account of the transfiguration of Jesus, including St. Peter’s line, “Master, it is good that we are here.” (Lk 9:28-36). In his homily, the pope echoed those words, telling the young people that it is always good to be gathered around Jesus and to keep Jesus at the center of their lives. Faith, he said, is a “Copernican revolution,” an operation that shifts concerns and priorities so that they revolve around Jesus and not the individual or false idols. Instead, he said, with Christ as the center of your life “you will never be disappointed,” but, he added, “the young must be strong” to resist the temptations around them. Getting practical about matters, the pope told the young people that Christ is waiting to wash away their sins in the sacrament of penance, to nourish them with his body in the Eucharist and to encounter them through their Christian peers who will give them friendship, encouragement and support. Micaela Ausili, 14, from Santo Cayetano Parish in Buenos Aires, Argentina, said Pope Francis makes all Argentines — “even if they are not Catholics” — proud. “His election made the entire country proud, not just because he is Argentine but because he is humble and simple … an example,” Ausili said. Contributing to this story was Lise Alves. Thank you Holy Spirit for the gift of Pope Francis.